Here I am enjoying a perfect sunny January morning in Paris. I cannot believe it has been ten years since we moved into our apartment on the Left Bank. A lot of fortuitous events have crossed my path over the years, but nothing has compared to that moment ten years ago when, in a leap of blind excitement, I began my Paris adventure. I have come to know this beautiful city very well and have found it to be a place of endless inspiration — and a place that has afforded me the luxury of reflection by simply allowing me time to walk in quiet thought without the distractions of cell phones and constant emails. It is amazing how I can live one way in the US and live so differently once I cross the ocean. 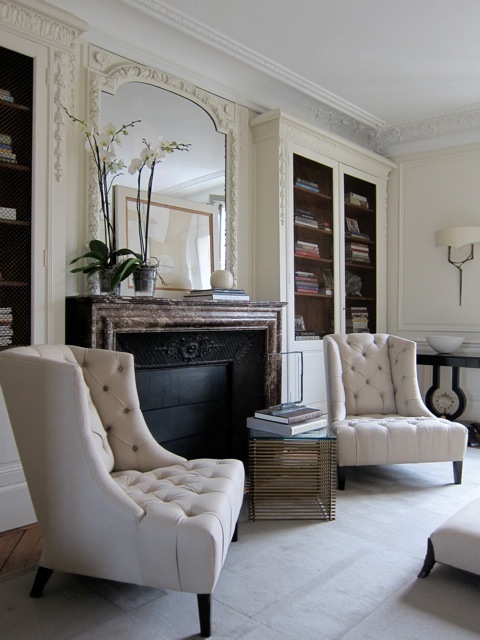 My Paris apartment has been a great place to recharge my creative battery. While most of its furnishings I have designed, I have acquired a number of pieces from dealers here on the Left Bank and the Flea Market. As often as I come to Paris, I never miss the opportunity to take at least one day and indulge myself with a trip to the Marché aux Puces (Flea Market). I do not know how many trips I have made to the Puces over the past ten years but there have been many. No matter what brings me to Paris — clients, holidays, a short stop on my way to another city — I always try to have one day available to check out the latest offerings at the market. I have developed a certain routine for this excursion that begins early in the morning. 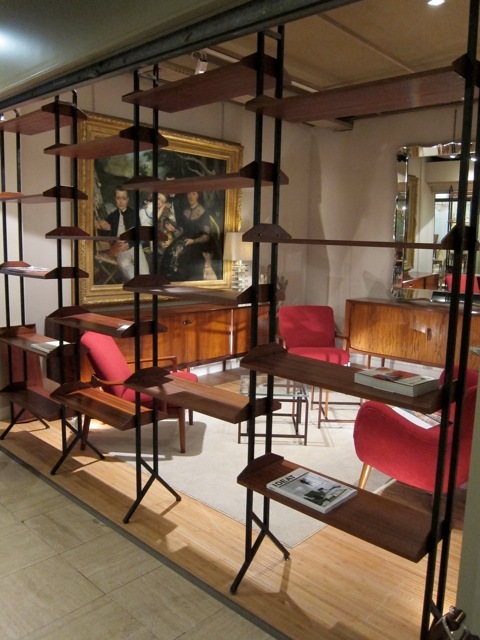 Last week I flew into Paris to attend the opening of the new Baker Showroom on Rue du Faubourg- St Honoré. The morning after the opening I decided to hit the flea market to check out some of my favorite dealers and perhaps find something I did not know existed but cannot live without. At the very least I always have my iPhone to take shots of any special pieces I may want to send to a client for approval or keep for my memory file. Early morning view from my bedroom looking across the Seine toward Sacré-Coeur. 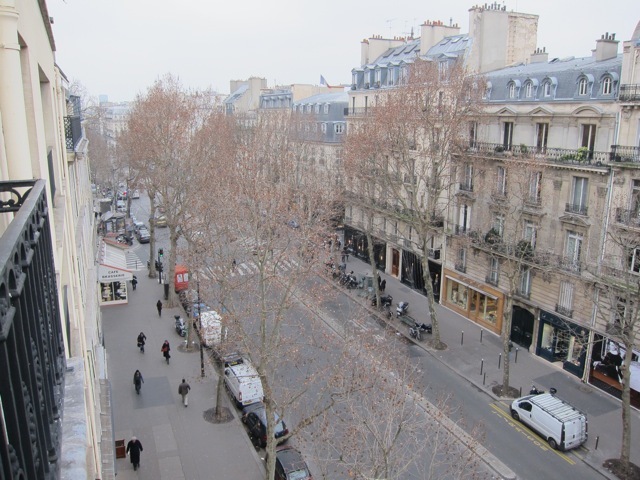 Looking onto Bd Saint Germain from my balcony. Since the Puces tend to close up early in the afternoon, it is best to arrive as early as you can. It is a beautiful sunny winter morning, so getting there by metro will be easy. 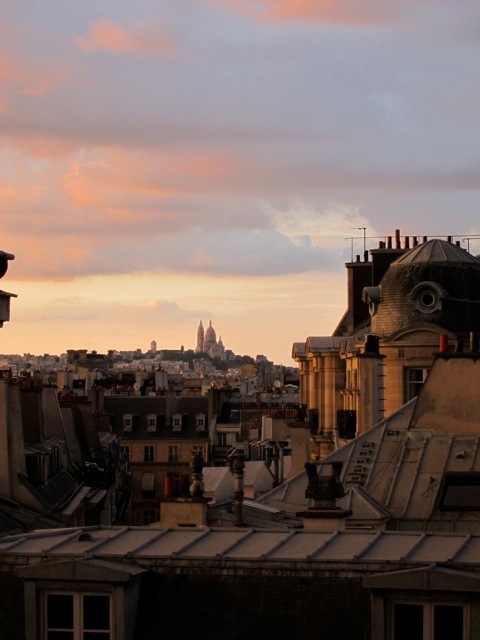 I step out of the apartment and head 2 blocks toward the metro St Germain-des-Prés. Just before I get to the metro station I stop at the corner kiosk and pick up the current edition of Pariscope. This is a small weekly guide to the happenings around the city. Museums, movies and theater events are listed so you can see at a glance what is going on. With the long day before me, I grab a table at Les Deux Magots for a quick double espresso and a croissant (what else would I get? ), and people watch for about 20 minutes. Actually, the only people walking by at this time in the morning are the travelers killing time until check-in time at the neighborhood hotels. They are easy to recognize with their exhausted faces and the rolling luggage trailing behind them. These are the moments of travel that make me so appreciate having my own apartment. 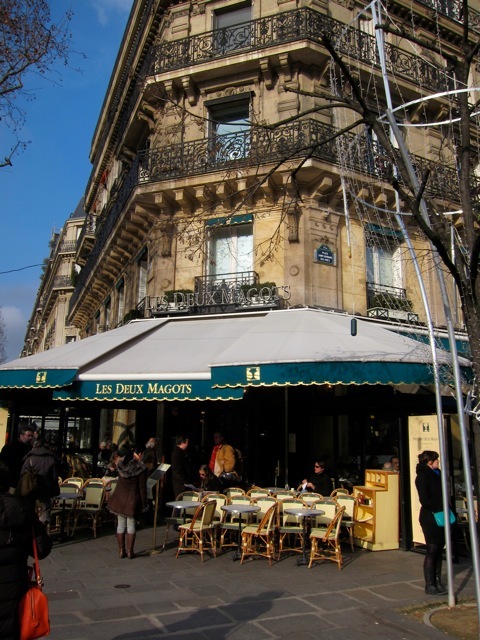 Les Deux Magots - a perfect spot to people watch. Caffeinated and ready to go, I enter the metro at St Germain-des-Prés and take the line to Porte de Clignancourt. It takes about 20 minutes, followed by a 10-minute walk to the area of the Puces where I typically find things to purchase or inspire. The flea market is enormous, so it is best to know specifically where to go. If I am short on time I head directly for Marché Serpette and Marché Paul Bert. 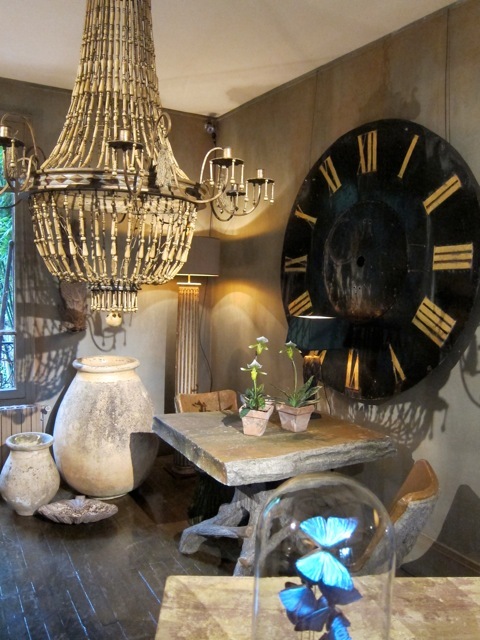 From the rustic to mid-century furnishings, you can find just about everything at the Paris flea market. Many dealers set up very impressive displays… this is not your mother’s flea market! You can count on an endless array of interesting lighting and accessories. 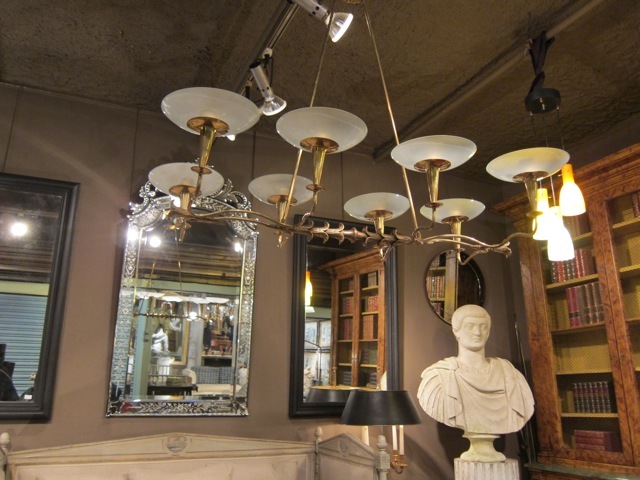 A great 1950s Italian light fixture. I enjoy taking friends and clients along with me, but I prefer those times when I am by myself and walking the endless rows of dealers without a list of things to find, or the pressure of keeping a certain schedule. Most of the dealers are very friendly and willing to engage in conversation. Do not be shy — they are there every weekend just waiting to discuss and bargain. This is one place in Paris they will do their best to converse with you in English. If you are having trouble understanding, just seek the help of another dealer close by. They would be happy to step in and help with translating. 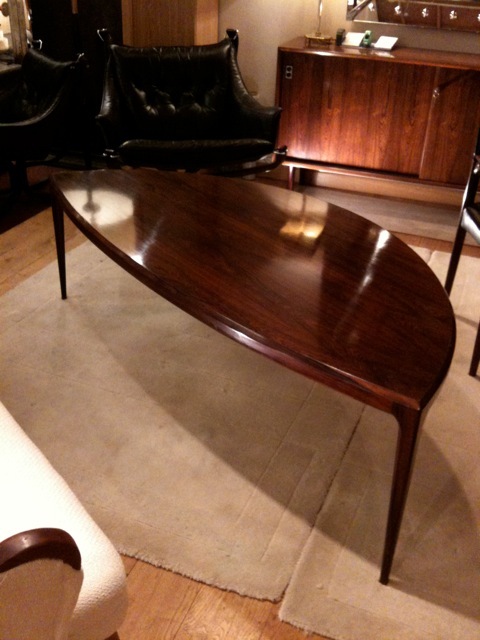 I love the shape of this Scandinavian coffee table. Over time I have learned quite a bit from the dealers and through my own observation. There have been a few items over the years that I passed on, only to regret on my flight back to DC, but overall I have made some great purchases for clients and myself. 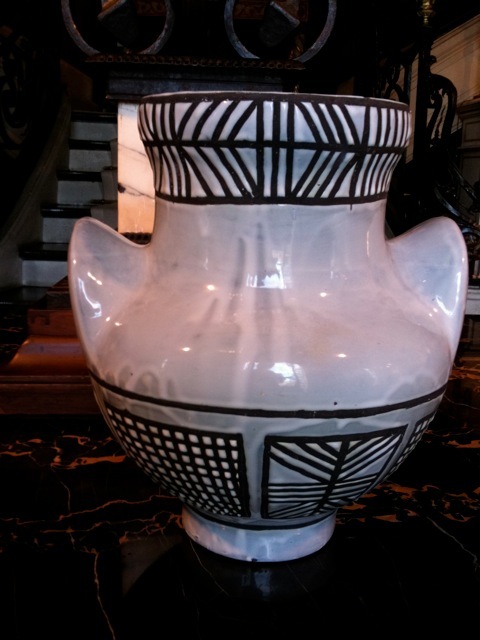 A beautiful black and white vase by Roger Capron. An unusual Colonial cabinet with carved slate top. I would love to incorporate this carved idea into a new design of my own. Along with old pieces there are a number of dealers featuring works by contemporary artisans. Some of these artisans are represented in swankier shops along the Left Bank. If you engage the dealers you will find that many of them have shops in other areas of the city. This can be helpful if you are looking for specific items that you cannot find at the Puces. 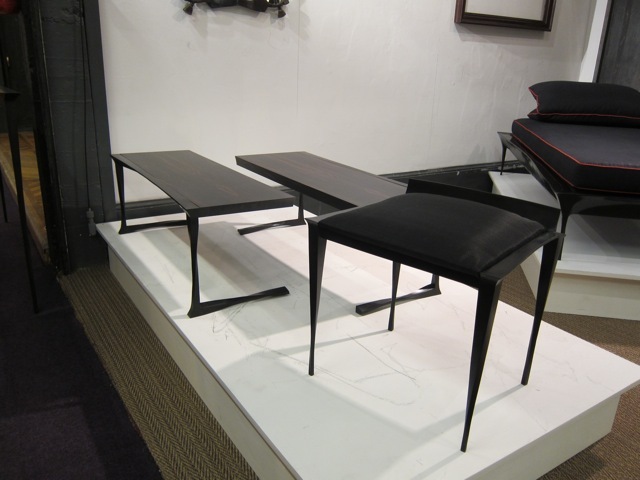 These contemporary bronze and wood tables are stellar. 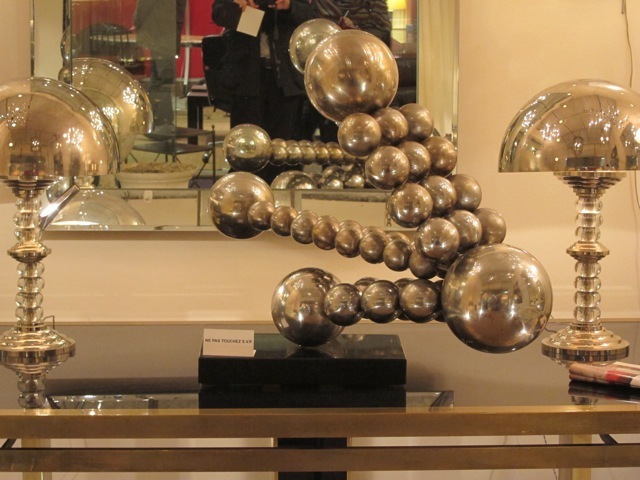 A steel and marble sculpture….where else could you find this? The nickel plated lamps are great examples of unique and beautifully crafted items that should not be overlooked. 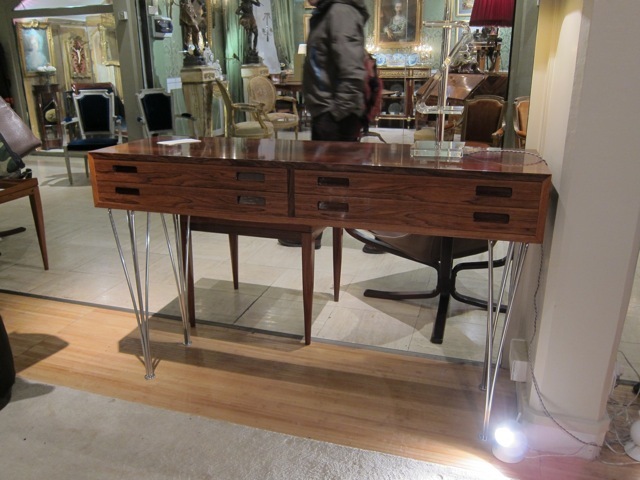 An elegant pair of Jensen & Hein consoles c. 1971. I would love to have these for my office in Washington. I remember my first year coming to the Puces. Everything was fascinating, and I felt the need to purchase everything I found remotely interesting. After a year of accumulating old objects, I realized it might be best to be a little more discerning — or at least only buy something that has a specific destination. As I write this, there is an old Paris street lamp, a life-size wooden torso of Jesus from a 12th century crucifix, and 14 French school-house light fixtures that have been in my DC warehouse storage locker for the past ten years. With all the interesting items I passed up today, I could not resist this vase by Roger Capron. It has found a home in the hall of my apartment. My final words of advice: If you are going to the Puces for the first time in hopes of finding a specific item at a fantastic price, you may be in for a big disappointment. While there are indeed great deals to be made, my advice is to go with only the idea of being entertained by a diverse collection of objects and furnishings that you won’t find back home. If you find something that you love, at a price you are comfortable with, buy it. The flight home is twice as long when spent thinking of the chandelier that got away! World-renowned designer Thomas Pheasant is currently working on the final touches for his new Baker collection to be launched in spring 2012. View the existing designs from The Thomas Pheasant Collection on our website. This entry was posted in Baker Designers and tagged antiques, The Thomas Pheasant Collection, Thomas Pheasant, Travel. Bookmark the permalink. Nice furniture photos, c’est magnifique, merci a vous de partager. Are the French school lights as pretty as they sound? I always wanted to going to the flea market, and you brought me there. Merci! Once again Tom’s words and photographs inspire me to be more mindful of the beauty in the world around me. 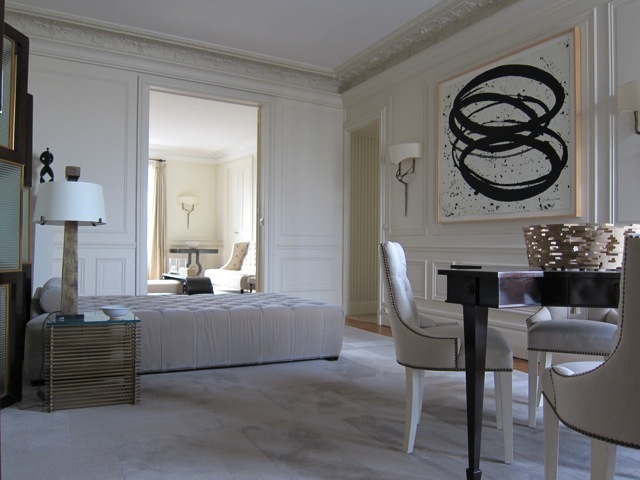 Now I understand how his interiors and furnishings evoke a sense of history, beauty and sophistication. Remarkable! I am acquiring the baker blog habit and anxiously awaiting each entry with the hope of gaining a new understanding of how a designer “looks at” and is inspired by their travels. Love your blog…..I can see it is your perfect place to “chill”! I know that wonderful things are to be found in Paris, and suspect that the Puces is a source of wondrous objects at potentially “nice” prices. Failing “nice” prices, it must offer, as does Paris in general, lovely things to look at. “I enjoy taking friends and clients along with me….” I can navigate the metro, so I can go on my own. I just require a short list of where to go and whom to see. While I know this is not quite a nice thing to say, the apartment looks as beautiful as I knew it would. I lol’ed at the part about the street lamps and the Jesus torso! The thing with design is that you just never know – you might need them someday! Sounds like a great trip! Loved this posting… Felt like I was strolling through Puces with Tom. How interesting to see actual pieces that spark and feed his creative genius! Looking forward to the new 2012 collection! Absolutely lovely to read and experience even more through the photos…only makes me want to catch the next flight to Paris! One can’t help but to admire the Parisians’ sense of style…During my last trip to Paris I simply didn’t have the time to visit the Marché, there’s nothing like the thrill of the hunt, and finding an object you didn’t even know you wanted … Thanks for your advice. I am amazed at how small the world is…I am a wall decor designer, working with Baker on our fourth collection. 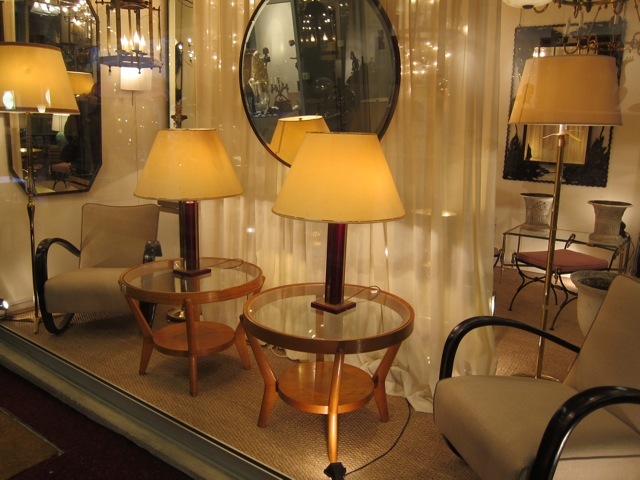 We did several things for Barbara Barry, that were on display at the new showroom on Rue du Faubourg St. Honore. 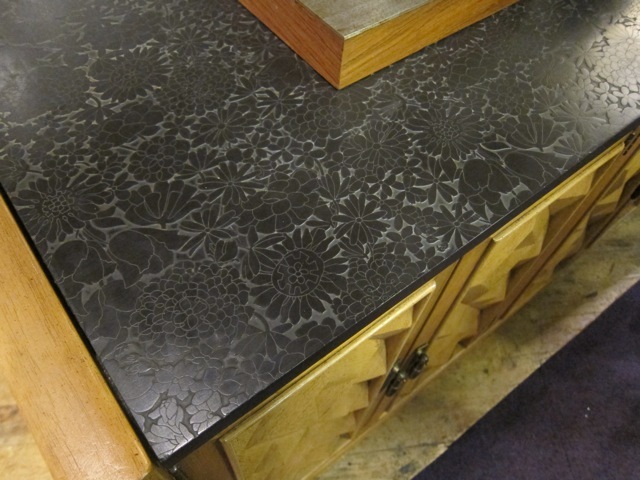 We were there for the showroom installation, Maison, and then took time out to go to the Flea Market (our second trip). I think we were there the same day you were! The last time we were at Puces, I found the most extraordinary wall tile sculptures, by Roger Capron.